A year ago, Leo took quite an outrageous mission…Biking from Boston to Toronto with little more than a bicycle and guitar, sketching chord progression and lyrics along the way. 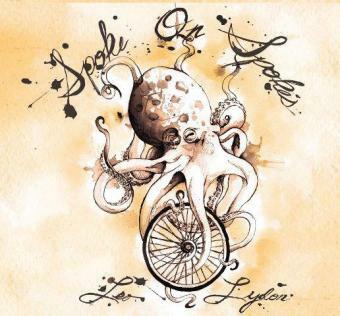 From this came his new release “Spoke on Spokes” which recorded in spring is due out this April. You can really feel the intensity and sense of openness, of journey on this release. A sense of travel with the sheer thrill of the unknown. Musically the album sits somewhere with the instrumentation of Explosions in The Sky meets Department of Eagles with touches of Hammock and the reverb tendencies of Grizzly Bear. Multiple guitar parts intertwining into some sort of symphonic folk opus is quite refreshing to hear. It’s a good reminder that there are still a few willing people out there seeking various methods of experimentation and pushing the envelope of music. Textures range from piano ballads, to delayed spaced out guitar, epic multi layered falsetto vocal harmonies, lyrics of beauty and a vibe that “everything’s gonna be alright”. Attempting to find a genre for Leo’s work ended in the all familiar response…. “no idea”. It’s quite a bold statement to make, but it couldn’t be more true. “Spoke on Spokes” is like nothing you’ve ever heard, but will leave you smiling just the same.